The government spends billions of pesos on different infrastructure projects each year. And as we all know it, government infrastructure projects have a direct correlation to the growth of a country’s economy because it is one factor that investors consider before starting a new venture. To make the most out of every peso spent on those projects, developers should consider using the best resources, manpower, and processes. By doing this, they can guarantee the entire nation and their partners that none of their taxes and money go to waste — every single penny is maximized to make the project successful. There is no better way to start a project than to create a well-laid out plan for every stage of the construction process. Developers and constructors should be armed with all tools necessary even during the planning stage. And one of the crucial tools for government projects are the 3D architectural infrastructure models. What are 3D architectural infrastructure models and why are they important? How are 3D architectural infrastructure models necessary? The scale of government projects depends on its scope. For the barangay or town level, roads, classrooms, and irrigation are the common priorities. But for national projects, the usual concerns are inter-modal bus terminals, bridges, airports, public housing projects, flood control facilities, and the like. This is where 3D architectural infrastructure models come into the picture. Compared to hand-drawn designs, 3D architectural infrastructure models are easier to create. It also provides better and more comprehensive visualizations for all types of buildings. By using this, developers and constructors can give the agencies concerned and other partner organizations a virtual tour of the place — letting them see the outcome way before the actual construction begins. Of course, 3D architectural infrastructure models are not only used mainly for visual purposes. More than winning a bid through impressive presentations, it can guide architects and engineers along the construction process. When used in government projects, engineers can also use it to create designs that would suit the topography of the place by showing overviews of all limiting factors. This will ensure the stability and durability of the infrastructure. By using these models, engineers and architects can also immediately point out errors and correct it right away. Through this, they will save time correcting any mistakes that can possibly happen when the actual construction begins. As a result, they can save both time and money — which is essential because the public’s eyes are on them, watching and analyzing how long would it take to finish another government project. 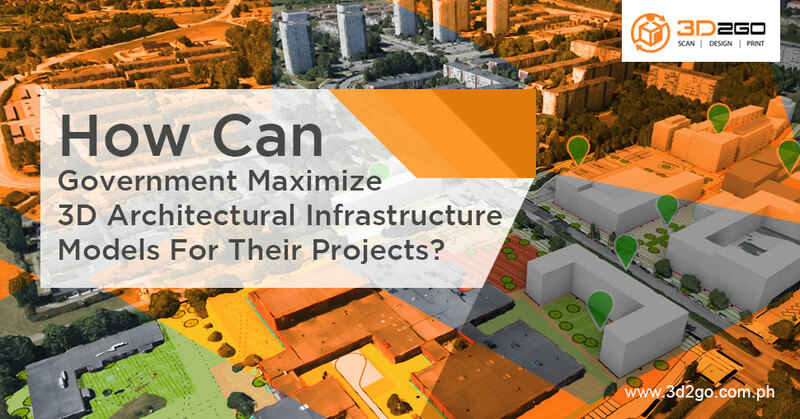 Because 3D architectural infrastructure models are available digitally and provide a seemingly finished picture of the infrastructure, architects, engineers, and contractors will have better coordination. It also allows them to lower project costs through the optimum use of materials. Government projects can be really huge that additional manpower or support is needed to fasten its completion. When that time happens, 3D2GO is always ready to assist especially in providing 3D modeling, 3D scanning, rapid prototyping, and reverse engineering services.